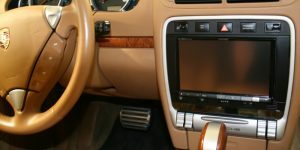 The expert technicians at Portland area Kingpin Car & Marine Audio are highly experienced in fabricating wood, plastics, metal and composite materials into custom subwoofer enclosures, interior panels, mounting fixtures and just about anything else an automotive or marine enthusiast can dream up. If you can envision something amazing for your vehicle or boat, Kingpin can bring that dream to reality. Dedicated Wood and Composites Fabrication Room – The wood and composite fabrication capabilities at Kingpin are nothing short of incredible. With four router table stations, an industrial-grade table saw, custom templates and proprietary speed rings, the expert fabricators at Kingpin can create just about anything and deliver a production quality finish. 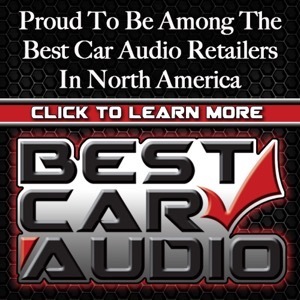 Custom subwoofer enclosures, dashboard modifications, interior panels or just about any other customized component of an audio system, interior or cosmetic enhancement. 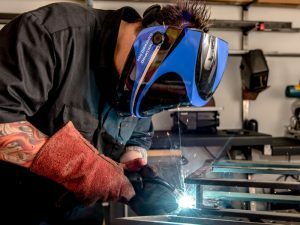 Dedicated Metal Fabrication Room – Kingpin’s dedicated metal fabrication room is outfitted with a well stocked inventory of steel, sheet metal and aluminum allowing technicians to create customized panels, mounting solutions and brackets. All of the requisite MIG and TIG welding machines, custom welding table for fixtures and exact alignment of welded parts as well as plasma cutting, grinding, shearing and bending tooling make Kingpin’s metal fabrication capabilities second to none. 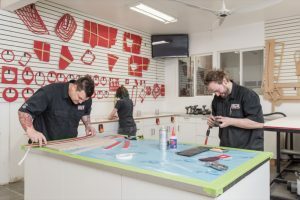 Dedicated Interior Trim Room – With a specialized room dedicated just for fabricating and upholstering interior panels, seats and trim, Kingpin’s interior fabricators have all the necessary tools and materials to create one-of-a-kind interiors that impress and amaze clients. Whether it’s creating leather wrapped custom door panels, a new custom molded seat for a classic hot rod or completely rebuilding a boat interior, Kingpin’s expert fabricators can handle the task. Spacious Installation Bay – A fully outfitted and neatly organized installation bay allows multiple vehicles to fit with ample space to open doors and work without clutter. All the vehicle’s panels and parts that require removal are carefully placed on storage racks away from the work area so that no accidental damage occurs. 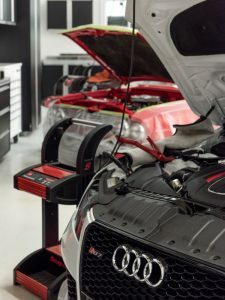 This level of detail and organization ensures your vehicle returns to you as well assembled as when you brought it in. When your vehicle is at Kingpin undergoing its transformation with fabrication work, it’s fully protected with custom seat covers, fender covers and protective film around any door or trunk openings to ensure no accidental scratches. 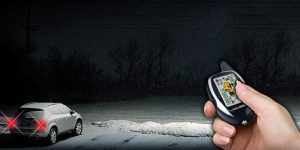 Kingpin also provides a connection to a battery tender that ensures no unnecessary battery drain while the vehicle is undergoing work and interior lighting or other electronic systems may be periodically activated. 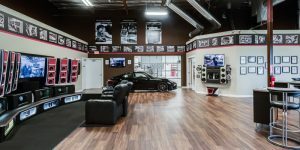 No other facility takes care of your vehicle the way Kingpin does. It’s just part of doing things that follow their philosophy, which is to do it only one way, the RIGHT way! With such an extensive array of fabrication tooling and capability, the sky is the limit at Kingpin Car & Marine Audio. From small and intricate modifications to full vehicle builds, the expert fabricators at Kingpin have the client’s needs covered. If you can dream it, chances are Kingpin can create it. 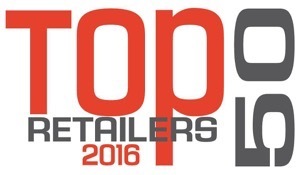 Stop by and visit Kingpin Car & Marine Audio today. Take a tour of the facility and see for yourself how the magic of Kingpin’s fabrication capabilities can be put to work in your vehicle or boat.